We’ve been back home for a few weeks now and I’ve had time to reflect on our travels from Alice to Broome and through the Kimberley. If I close my eyes and think back, I see a dusty red road, the bright white stars in a velvet sky at night and the glow of a campfire. Each day is punctuated by a regular routine. We’re up early with the sun, splashed awake by a cold water wash in the early light. Breakfast is a bowl of muesli, eaten standing. The pop top camper on the back of our ute packs up with a little tug of encouragement, folding down reluctantly with a rush of air and a sigh. Chairs away, a final check and we are off. Each day we stop for a cuppa and a bite mid morning. Time to stretch our legs, laugh and chat with our fellow travellers and take a break from the road. A few more hours’ drive and it’s lunchtime. A sandwich, slice of cake or some fruit. A hot cup of tea. Simple pleasures. Back on the road again until afternoon tea. Conversation turns to our campsite for the night. Will we make our target destination? With Beryl not at her best, we often plan to stop early, if a spot presents itself. Howard has a geographical memory. He follows a song line. Like an inscrutable aboriginal guide he looks into the mid distance, his eyes go misty and he rubs his chin. “I think I know a good spot.” More often than not, his sixth sense connects with an ancestral memory and we hurtle down some off-road track as the sun sinks and the light fades, trusting him to find the perfect camp. In my reverie of reflection, I smell the scent of the outback. A herbal sandalwood aroma meets mint with an overtone of spice. Bush scents mingle with the charcoal smoke of the campfire. I hear closeby the cackle of the blue-winged kookaburra and the caw, caw, caw of the raven. In the distance I hear the eerie howl of the dingo. I feel the age of this ancient weary land. It’s odd, the eastern coast of Australia does not feel this way, but here, in the outback, the layers of history weigh heavy on the land. It creaks and sighs with the aches and pains of age. It hums with the power of ages. Travelling here could easily become a spiritual journey for those with their hearts open to such things. This ancient land has a terrible beauty. Here you see wild untamed natural wonders, rocky gorges, dry creeks, wild flowers of all hues. The Kimberley is a wonder of the world. Nature here is on its own terms, huge in scale, dramatic and impassive before our human gaze. It’s the perfect antidote to our 21st century virtual world. Movies can’t reproduce this. You can’t capture it on instagram. It looks back at you and puts you in your place. I saw indigenous rock art as if for the first time on this trip. The Kimberley truly is an extraordinary outdoor gallery, where you can see layers of art through the millenia. Where you can view artwork where it was created, framed perfectly by the craggy rocks that surround it. I need to see more and understand more. 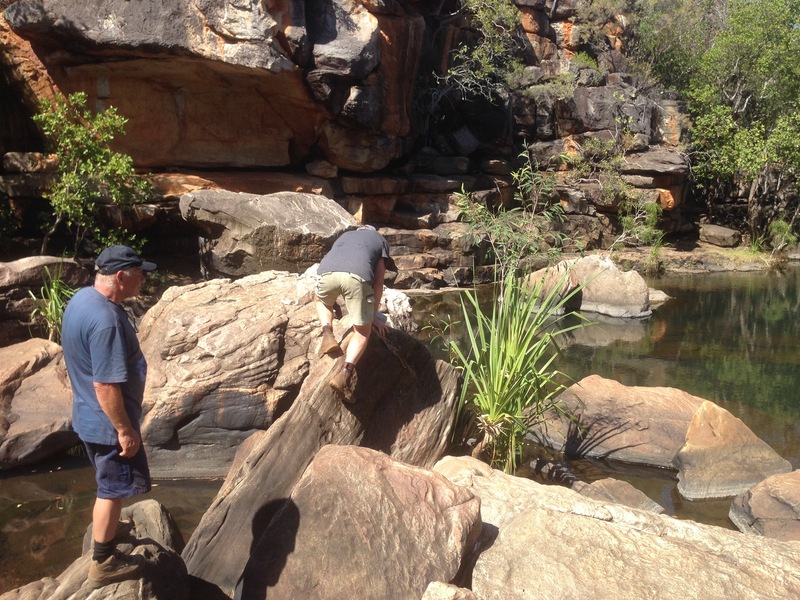 I also saw with some trepidation that the Kimberley has opened up to the world. Campsites are full. The roads are busy with Britz campers. I hope tourism helps to protect this wilderness and does not convert it into an outback theme park, devoid of its spirit, its danger and discomfort removed. I hope, I hope. This entry was posted in Australia, Outback, travel and tagged Australia, Kimberley on 12/08/2017 by Deb McSephney. It sends a shiver down my spine. I see strange elongated figures dancing, wearing tall headdresses, limbs swaying to the beat. They share a space with crosshatched echidnas, giant kangaroos and striped thylacines. I almost hear the voices from the past, ancient humans communicating across tens of thousands of years. The rock art in the Kimberley region is unforgettable. On our way back from Mitchell Falls, we find two aboriginal art sites. The land here is flat and sandy, dotted occasionally with stacks of quartzite boulders. The cultural sites at Munurru are well marked and easy to find from the road. The well beaten path from the car park leads the way, but then you are on your own. There are no signs telling you where to look, or even what to look for. We become explorers, searching the jumbled pile of flat rocks and rounded boulders for the best place to paint. We look for a hidden recess, the underside of a rocky overhang, the roof of a small cave – a flat piece of rock, easy to reach, well protected from the elements. We try to think as the artists did, to adjust our eyes to look for a red, white or yellow line that is man made. And suddenly the art begins to reveal itself. The paintings are drawn in red ochre, yellow, black and white. Many are overpainted. Some are clearly recognisable human figures, animals and plants. Kangaroos are easy to recognise. There are root vegetables, maybe yams? A striped animal with a straight tail has to be a thylacine, the Tasmanian Tiger, painted thousands of years ago when he still lived this far north on the mainland. He’s sadly now extinct. Two huge birds painted lying horizontally, head to head, look like brolgas. Thankfully these elegant birds are still with us. Human figures wear what appear to be grass skirts and pointed head dresses with tassels. They are shown moving, with bent knees and elbows, I assume in a dance. They are beautifully painted in a very distinctive style. Apparently they are examples of the famous Gwions or Bradshaw figures that are found throughout the Kimberley region. People are also painted more simply, carrying bags or boomerangs and wearing skirts. Pictures of daily life. Leaving the obviously human figures, we move on to panels of otherworldly creatures. Odd squatting frog like figures appear in one shelter. I learn later they are child spirits, the first sign of new human life. When a woman is found to be pregnant it is believed her husband has dreamed of a child spirit and allowed it to enter his wife. It is said the child spirits came originally from the Wandjina, the mythical ancestors who sang the land into being. The Wandjina panels at Munurru are eerie. The ancestors have stark white alien faces with large blank eyes that stare impassively back at the observer. They guard a burial site where a human skull and bones have been placed on a rock ledge in the sacred site. A common practice in this tradition. A cooling wind blows gently through the boulders, but the air is heavy here with human history, with stories of the oldest surviving human culture on the planet, with images representing powerful myths that have endured for millennia. 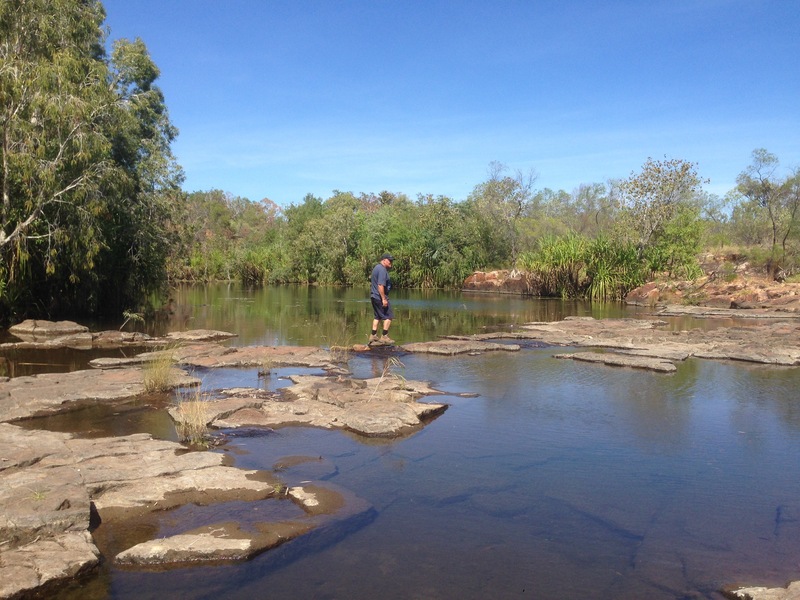 Research continues, but recent dating of artefacts in the Kakadu indicates that aboriginal people have lived on this continent for 50-60 thousand years. Imagine that. It’s humbling. This entry was posted in Art, Australia, Kimberley, Outback, travel and tagged Art, Kimberley, Rock Art, Travel on 25/07/2017 by Deb McSephney. The worst road in Australia leads to Mitchell Falls. It is the Kalumburu Road. It is a hard gravel road, corrugated so badly that the vibrations will find and shatter any weaknesses in the metal and plastic of your vehicle. It is a rocky road, full of washouts and pot holes. The rocks are sharp and pointed and cut through brand new tyres without a second thought. It takes 2 or 3 hours to travel less than 100 km and at the end of it you feel like you’ve spent the afternoon rattling around inside your washing machine on quick spin. Hey, we know how to have fun! It’s awful. We passed top-of-the-range offroad campers with broken axles, 4WD utes with lost bullbars, overheated red-faced men changing punctured tyres and recovery trucks taking trusted vehicles for repair. Inside our Land Cruiser, the bracket for the reversing camera fell apart. Outside, our metal toolbox, welded to the ute tray, was hanging by a spot weld. All fixed with some tape and strapping. We were the lucky ones. So, I hear you ask, why oh why would you do it? Oh it’s worth it. It’s worth all this and more to take the walk to Mitchell Falls. If you are visiting the Kimberley, this may well be the highlight of your trip. It was certainly mine. Turning with relief off the Kalumburu Road, we navigated the deep King Edward river crossing then stayed overnight in the nearby Munurru campsite. This is a popular and attractive grassy site by the river, an excellent spot for weary travellers, with everything you need – swimming, fishing and good toilets. We sampled some of these delights, but didn’t stay long, leaving early in the morning to take the Mitchell Plateau track up to the falls before the sun rose to high in the sky. This track was a rough one, but nothing like the day before. Lush livistonia palms took over the vegetation as we rattled further north, vibrant green fronds covered liberally with paprika red road dust as we passed. After a couple of hours we arrived at the car park, ready to walk to the falls. It’s about a 9 km hike. 9 km of the most varied terrain imaginable. It had everything, I loved it. Let me count the ways… it had inviting swimming holes, ancient rock art, rock hopping over huge boulders, flat rocky plateaux with vertigo inducing drops, lilies, birdsong, inclines up and down, wading across a fast running river and then, at the end, the glorious Mitchell Falls, also known as Punami unpuu. You feel small before the mighty Mitchell Falls, even at a distance. And you have to have that distance to take in the scale of the four tiered waterfall. The Mitchell River hurtles over a precipice before crashing down into a vast rock pool, collecting there, then tumbling down again, and again, and again, before continuing on its way to the sea. The natural energy released here is vast. It’s tangible. You can feel the air humming with its unstoppable force. Looking across at the falls from my perch on the other side of the gorge, I couldn’t quite believe it’s raw, powerful beauty. A photo will not do it justice. Of course, you can fly in by helicopter and hover above the falls without getting your feet wet, your brow heated or your clothes dusty. But to me, the journey is a must. I felt the same when I visited Uluru, you have to drive the corrugated road and walk the dusty track to feel the wild, remote power of these natural wonders. This entry was posted in Australia, Kimberley, Outback, Photos, West Australia and tagged Australia, Kimberley, Mitchell Falls, Outback, Travel on 25/07/2017 by Deb McSephney. It’s dark in here. All I can see are some dancing lights ahead with the sound of water splashing as footsteps come towards me. We are walking in a long dark tunnel carved through the Napier range by the waters of Tunnel Creek. I am barefoot, feeling the crunchy coarse sand and cool water on my skin. I begin to make out the shapes of the people ahead as they splash through the water towards us. The walls of the cave are ochre red and white. Stalactites hang down and create amazing shapes in the shadows of the torchlight. All is pitch dark except where the torches flash. It’s impossible to see the depth of the water in this light and we are cautious as we step into a dark deep pool of water ahead. It’s quickly up to, and then over my knees. I hope there are no freshwater crocs in here. We walk on. We hear water falling into the creek to our left and point the torchlight that way to find a small waterfall where the creek water falls in a bubbling curtain over a marble white overhang. We watch for a while. Maybe that’s the head of a croc lying under the waterfall? No, no, it’s just a stick throwing strange shadows. The tunnel is about 750 metres long. The ground is rocky in places and I wish I had waterproof shoes to protect me from the sharp edges and uneven surface of the creek’s course. Splash, splash. We turn a corner and fierce bright sunlight pours through the end of the tunnel ahead. Clambering out, squinting in the light we walk under the shade of palms and blood woods. Howard calls and we look up to see him peering down from a limestone overhang above. “Up here. Rock art!”. Indigenous people have used this tunnel for centuries. But there’s a more recent story that conjures up ghosts as we walk back through the darkness. This tunnel is said to have been the hiding place of an aboriginal man known as Jindamarra, nicknamed Pigeon. He appears to have been a kind of black Ned Kelly, an indigenous outlaw. Working for the police as a tracker, he is asked to round up men from his own people. He does as asked, but then relents, kills the accompanying policeman and sets his compatriots free. They run off with him and the gang hide in this mountain range for 3 years, raiding the local area for food and some say leading an armed insurrection against the police. He becomes a hero to his people, who believe he has supernatural powers to avoid capture for so long. The police are desperate to catch him, as a rebel, for killing their own, and as a turncoat who they had once trusted. Eventually they find their man, and he is injured in a shootout. He hides in Tunnel Creek to nurse his wounds, there they track him down and he is killed. Wading back though the water with our 21 century torches, this tunnel is still daunting. What a hiding place it must have been. How deep into the tunnel in the dark did he hide? How did his hunters discover him there? What shouts and cries reverberated around this place? Like all the best stories, many questions are left unanswered and so to our active imaginations. We reach the stone waterfall. Halfway back. The torch shines under the overhang. That stick? It’s gone. It was a croc after all! Splish, splash we hurry out towards the safety of the daylight ahead. The story of Pigeon and the darkness of the tunnel lingering in our minds. This entry was posted in Art, Australia, Outback, travel, West Australia and tagged Tunnel Creek, West Australia on 21/07/2017 by Deb McSephney. Outside Derby there is an ancient boab tree. They call it the prison tree. They say this tree is around 1500 years old. It has watched many cycles of human history. When boabs age, they become hollow inside. Trees this old are big enough for men to stand in. The story is that the boab was used as a staging post for captured aboriginal people in early colonial days. Under the beauty of a Kimberley sunset lies the dark past of the region. The original inhabitants were treated with cruelty and disdain. Dispossessed of their land, they were made into indentured servants, little more than slaves or killed if they did not submit. They were captured and tethered to trees awaiting their fate. While the history of this particular tree as a temporary prison is apparently suspect, it symbolises this violent period of Australian and British colonial history. I found it a very disturbing place. A reminder that this country was built on dark deeds. This boab tree is still alive. It’s not a monument but a living individual, scarred by tourist graffiti and morbid attention. Has it absorbed some of the evil that was done here? Perhaps. I felt I needed to see and acknowledge its pain. I needed to say sorry for what we’d done. ﻿Call me a tree hugger. Call me crazy. But that’s what went through my mind when I walked around this old boab tree. It is still imprisoned by our past. This entry was posted in Australia, Outback, travel, West Australia and tagged Boab, Derby, prison tree on 20/07/2017 by Deb McSephney. Watch the sunset from Derby wharf. Bring drinks, nibbles a comfortable chair and your camera, if you like. Or simply your eyes and ears. It’s not a big tourist town. You won’t have to peer over the shoulders of Country Road clad holidaymakers from the big cities. The wharf is simple, industrial. Timber planking underfoot, walk out along the wide pier and watch the eddies of the tide swirl in the water. Walk west along the wharf. The water becomes translucent, rose pink, amber, shimmering. The sun seems to grow larger, dripping its final molten rays into the sea. I apologise for the flowery words, but it’s a beauty. This entry was posted in Australia, Outback, travel, West Australia and tagged Derby, Outback, West Australia on 18/07/2017 by Deb McSephney. Freshwater crocodiles are becoming more aggressive in Geiki Gorge as they grow familiar with human traffic. They soak up the sun on the sandy banks of the Gorge, mouths open in a long lazy yawn. Occasionally one will slip into the water for a feed of barramundi or smaller fry. Like their larger more dangerous cousins, the saltwater crocs, they are a remnant from the age of the dinosaur. They proliferate here under the protection of the national park. We take a boat trip along the Gorge with the Departmemt of Biodiversity, Environment and Attractions. I think I’ve got that right, the park ranger stumbles over the clumsy new name. We glide across the water in an unsinkable flat bottomed boat, 25 years old. She’s to be replaced with a fancy upgraded version later in the month. The new boat, costing millions, will have toilets, bow thrusters and a shiny paint job featuring smiling crocodiles. This may draw in the punters, but the toilets and bow thrusters can’t be used in the national park, and the ranger will be sad to see old faithful go. The Geiki Gorge stands tall above us. It is the remnant of an ancient Devonian coral reef. The water has cut into the rock over the years, creating vast overhangs that shade the river. A fig tree high up on a limestone ledge stretches its roots hundreds of metres down to dangle them in the cool clear waters below. Pink and white, sculpted like the backbone of an enormous dinosaur, we marvel at nature’s artwork. The crocodiles fascinate us. Young ones lie in groups and slide into the river for safety as we pass. A grumpy old grandfather looks up to see who has woken him from his dozing, then closes his eyes again to dream of fish suppers. It is late in the afternoon when we leave the Gorge and the sun is sinking rapidly. Five o’clock is sunset this far north. We drive back to Fitzroy Crossing where the local rodeo is in town. Then head off on the road to Broome. Howard is convinced he can find a little bush camp out of town. The bitumen road to Broome holds little hope for the bush camper. On and on we drive, as the setting sun drops lower and lower in the sky. Finally the turn off to Tunnel Creek appears to the right. It’s a gravel road. Maybe there’s a place to stay for the night. We drive along several kilometres of fenced road without luck. Then, up ahead two boab trees stand sentinel either side of the road. Their branches like arms raised in silhouette against the twilight. “This looks promising”. We find a clear spot near a fence corner, build the camp fire and set up for the night. In the morning we wake to see that our sentinel trees mark the start of boab country. The landscape is dotted with these incredible bottle shaped trees. Their trunks are a shiny elephant grey, skin stretched over a knarled skeleton. Some are huge and ancient, covered in warts and with misshapen limbs. Others are young and supple, lifting graceful bodies to the sky like ballerinas. A couple stand together, entwined in each other’s arms, trunks leaning close, whispering sweet nothings. The boab is more than the average tree and this is their country. Boab country. This entry was posted in Australia, Outback, travel, West Australia and tagged Australia, Boab, Geiki Gorge, Travel on 17/07/2017 by Deb McSephney.